As a young person in an organization full of seasoned experts, I often find myself wanting to learn and do more to not only contribute to the organization’s goals, but also to develop my own personal skill set and knowledge base. In today’s workforce, most young staff, myself included, are part of the millennial generation, a generation that has been defined as tech-savvy, witty and is used to having information at our fingertips. However, most of us also value the importance of learning and deep discussion as much as previous generations. I believe that personal skill development and discussion of pertinent issues are critical to defining this generation. This two-day intensive workshop included 35 young people—mostly from the West Coast: Oregon, Washington and California, as well as myself from Washington, D.C. and another recent college graduate from Tallahassee, Florida. Approximately half of the participants were seniors in college (some attending Lewis and Clark) and the other half were young professionals, recently out of college, similar to myself, looking for networking opportunities. The workshop leaders had us work in groups for several exercises which quickly forced us to get to know each other and learn about our different backgrounds. The first major exercise was something I would not have expected but found interesting since NRDC, as a non-profit, often does this: learning how to effectively make an ask, aka: fundraising. My group and I found this somewhat challenging since making a professional ask is not something we do on a regular basis. We came up with a pretend scenario that involved bringing fresh, local, organic food options to a college campus dining hall and asking for funding to start a campaign on the campus that placed an emphasis on the importance of knowing about the food that we put into our bodies. Though a challenge, by the end of the exercise my group felt that we learned the necessary skills to most effectively make an ask which included having a well-backed plan, strong eye contact and not questioning our financial request. Throughout the rest of the workshop, we were asked to work on personal communication skills, such as writing about ourselves (storytelling) and speaking in front of a small group. The exercises forced me to think about myself, what my strongest attributes are where I needed more work. These types of skill development sessions would be beneficial to not just the millennial generation, but also to others looking to develop leadership skills and learn more about themselves. By the conclusion of the workshop, I was pronounced an official “C2C Fellow,” meaning that I am now part of a network that will provide me with an ongoing community: updates, web-based events, career counseling, a social network of like-minded leaders, and ongoing educational opportunities. Some of these web-based events include speakers who lecture on a variety of environmental issues. In fact, NRDC’s own Dan Lashof, Director of the Climate and Clean Air program, was featured earlier this year as a speaker on cutting carbon from power plants! I am looking forward to continuing this journey as a C2C Fellow and exploring the opportunities that will be available to me as a member of the millennial generation. 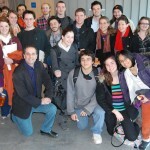 Many thanks to Bard College’s CEP for providing me with such a great opportunity! Enjoying downtown Portland, Oregon on a Sunday afternoon. Kelly Henderson is a Climate Center Program Assistant with NRDC in Washington, D.C. Kelly has a B.S. in Environmental Studies, and a deep desire to make a difference in the way people view protecting the Earth. Before joining NRDC, she interned with the Army Corps of Engineers in their Regulatory Division in southeastern North Carolina doing wetland preservation and research. Kelly loves spending time in and around the ocean, and when not in the office you can find her biking, cooking, swimming or just spending time outside! 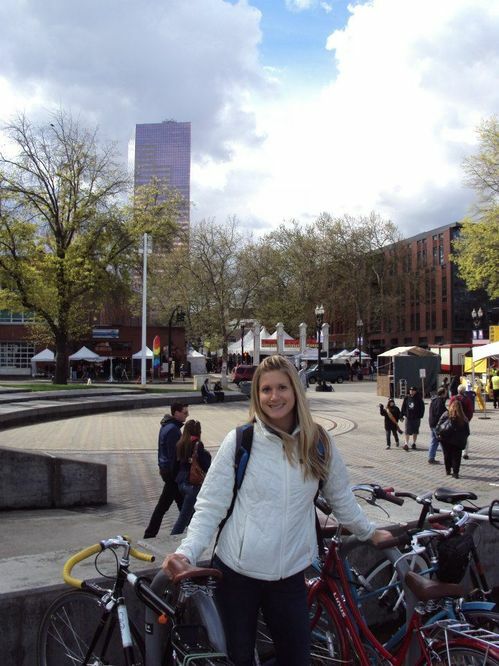 Kelly attended the C2C Fellows workshop in Portland, OR in April 2013. C2C Fellows are young sustainability leaders from across the country committed to pursuing meaningful careers in sustainable business and politics. Leaders join the national network through participation in a weekend long leadership workshop, and remain engaged with the network moving forward into their careers after college. For more information, visit www.bard.edu/cep/c2c.